The Agilent Cary 610 and Cary 620 FTIR Microscopes and Chemical Imaging systems represent the latest in cutting-edge performance. Leveraging off the latest in technological developments, the systems now deliver unparalleled spatial resolution and sensitivity, which coupled with a wide range of options, provide flexibility to suit applications ranging from routine measurements to cutting-edge analytical development. 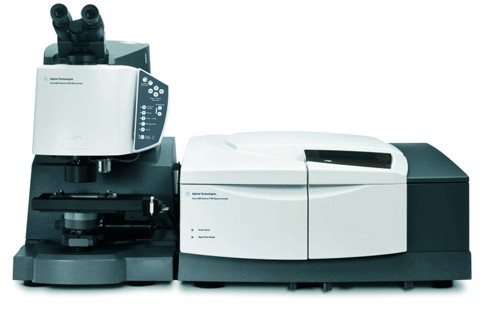 The Cary 610 is a single point FTIR microscope, capable of mapping, while the Cary 620 is a Focal Plane Array (FPA) chemical imaging FTIR microscope. 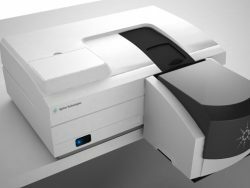 With the option to couple the microscope to either a research-grade Cary 660 FTIR or top of the range, air bearing, Cary 670 FTIR spectrometer, you get two instruments in one – a research FTIR spectrometer and an FTIR microscope. The Cary 610 microscope can be upgraded to a Cary 620 at a later date, giving flexibility for when application needs change. A Synchrotron IR beamline provides the ability to analyze biomedical samples down to the micron level of detail. The Agilent Cary 620, with its unsurpassed IR energy and proprietary high magnification optics, provides similar capabilities…only faster and in the convenience of your own lab. Have access to your own Synchrotron every day of the year. Identify the individual layers and defects, as small as 2 µm in polymer laminates and films within minutes by removing the need for resin embedding, thereby saving up to 24 hours in sample preparation time. Increase sample throughput and reduce your cost per analysis. Identify micron-sized defects in seconds with micro ATR FTIR Imaging using Agilent’s unique live FPA imaging with enhanced chemical contrast. Never damage delicate samples again by applying too much pressure. 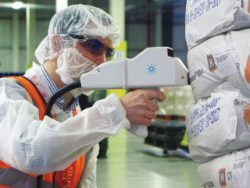 FTIR Chemical imaging is now a well-established analytical tool that provides micron level spatially resolved, full FTIR spectra across a 2-D Field Of View (FOV), thus allowing high definition chemical images to be created, for easy and detailed molecular chemical distribution visualization. 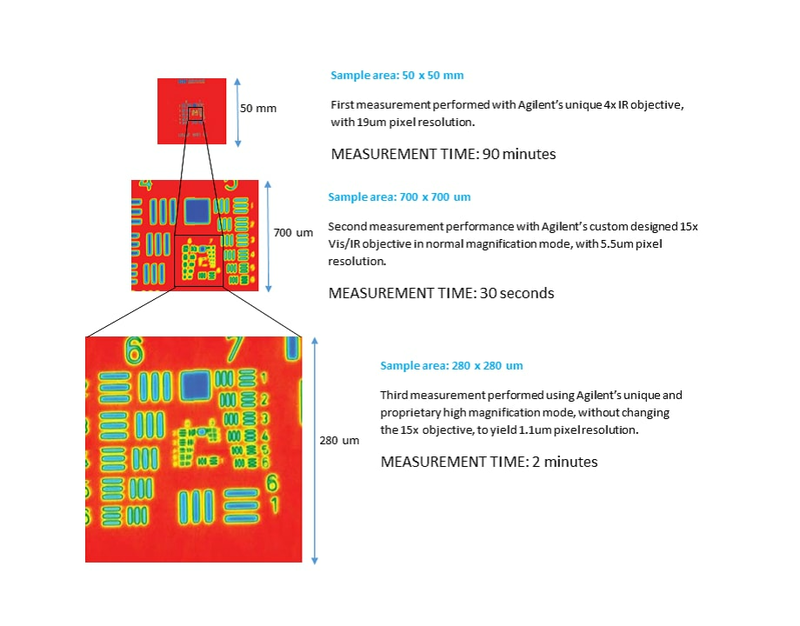 Agilent’s Focal Plane Array (FPA) detector based FTIR chemical imaging system are the ultimate in chemical imaging technology and can simultaneously collect a full chemical image (containing up to 16,384 spectra per scan with a 128×128 FPA) simultaneously across a Field of View (FOV) of up to 2.4×2.4mm or in high magnification mode, can measure with a 1.1 micron pixel size, all within seconds. 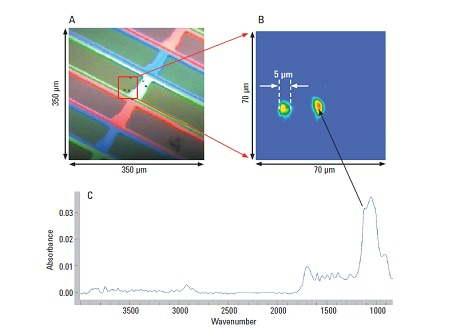 Alternative FTIR imaging technologies, employ lower performance 1×16 linear array detectors, that collect at most 16 spectra per scan, over a limited FOV of 6.25×100 microns, requiring thousands of line scans to build up a reasonable sized FOV, thus requiring significantly more time, poorer pixel size of no better than 6.25 microns thus leading to a compromise in data quality. The performance of FTIR imaging microscopes are often characterized using the USAF 1951 optical resolution target. This series of images demonstrate the power and flexibility of the Cary 620: image the entire USAF target (50 x 50 mm) measured in 90 minutes – and then a subsection, at approximately 1 pixel resolution, in less than 2 minutes. Thin and delicate, polymer laminates and films often have to be embedded in resin its cross section can be successfully measured and characterized. This process can take more than 24 hours, while the resin cures and is then cut and polished. The Cary 620 is the only FTIR imaging microscope that can measure these polymer laminates directly and without any resin embedding, by simply placing them vertically in a micro-vice sample holder and positioning that on the microscope stage. Measure in minutes what others take hours to days. Rapid, easy and accurate materials characterization is dependent upon ensuring the contact pressure between the sample and the ATR is carefully applied and monitored. Too much pressure and you damage your sample; too little pressure and your data quality is poor. The Cary 620 imaging microscope does this via a unique visual and direct feedback mechanism – as you raise the sample stage and begin to make contact, a live FPA image of the sample, with enhanced chemical contrast is displayed to allow users to clearly visualize the quality and degree of contact. In doing so, just enough pressure is applied, avoiding the need for resin embedding or any sample damage. No other manufacturer offers this revolutionary feature. All that you see as you apply excessive pressure and damage your precious sample when you use other FPA systems are the three top images on the diagram to the left. The only safe way to analyze samples using any other system is with time consuming, sample preparation techniques such as resin embedding. Troubleshoot defects without costly sample preparation. The Cary FTIR microscope can acquire spatially resolved chemical information down to the micron level in minutes. Avoid damage to delicate samples. Real-time visual feedback lets you know exactly when ATR-sample contact is perfect for good measurements, yet gentle enough to prevent sample damage to even the most delicate of samples. 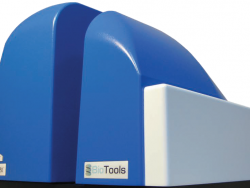 Optional Large Sample Objective adaptor for the Cary FTIR allows you to measure samples as large a helicopter blade or the panel of a car quickly and with high spatial resolution. The Cary 620 FTIR microscope can achieve spatial resolution and data quality comparable with that of a synchrotron – in a fraction of the time. 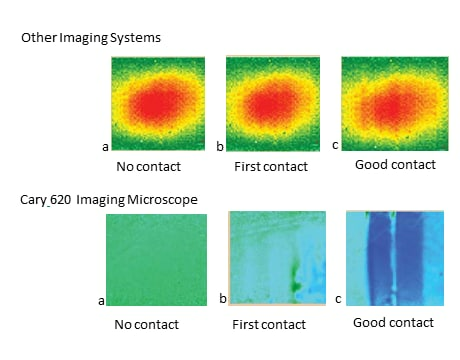 The example above compares data collected from the same biomedical sample: on the top are results collected using the Cary 620 FTIR microscope and on the bottom data collected on a multi-beam synchrotron-based FTIR imaging system. 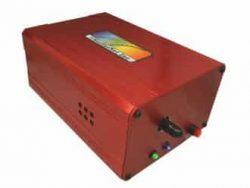 The Cary 620’s high resolution optics provides comparable results, to allow high spatial resolution sample characterization, in less than 10% of the time. Now, you can harness the power of a synchrotron in your lab. With the Cary 620 you can detect subtle chemical changes in tissues and cells (without staining), study diseases such as cancers, Alzheimer’s and MS, and undertake revolutionary novel research programs that were, until now, unresolvable.